Jean Michel-Basquiat, Untitled, 1982. Oilstick, acrylic and spraypaint on canvas, 72 1/8 by 68 1/8 in. Estimate in excess of $60 million © 2017 The Estate of Jean-Michel Basquiat / ADAGP, Paris / ARS. Courtesy Sothebys. 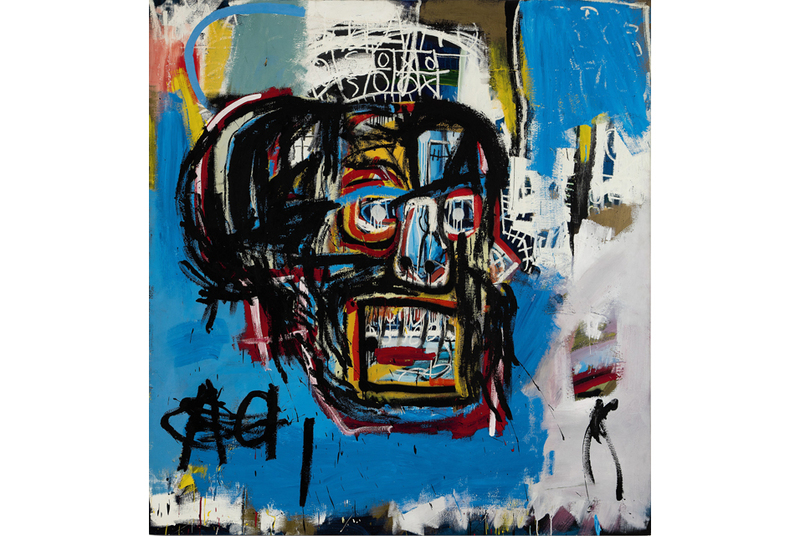 NEW YORK (AFP).- Jean-Michel Basquiat enjoys a stratospheric following -- earlier this year, a 1982 oil painting by the late 20th century great became the most expensive work by a US artist ever sold at auction. New York is where the black artist -- son of a Haitian father and Puerto Rican mother -- was born and raised, spent most of his life and drew most of his inspiration. On May 18, it was in the Big Apple that one of his paintings fetched $110.5 million at Sotheby's, jettisoning him into a pantheon of high-selling greats like Picasso. Yet America's cultural capital has no public monument to him, no institution named after him and has preserved none of his famous graffiti -- signed "SAMO". "There's a lot of interest," says Lisa Alpert, vice president of development and programming at Green-Wood. "They leave things on his grave." Out of the more than 2,000 works of art that Basquiat produced, New York's Museum of Modern Art (MoMA) has just 10 drawings and silkscreens, the Whitney has six, the Metropolitan two, the Brooklyn Museum another two and the Guggenheim one. Much of his work fused drawing with painting -- it was abstract and figurative, offering biting political commentary on social problems such as poverty, segregation, racism and class divides. "There's a lot of racism and a lot of white privilege in the idea that only white people are important artists," says Holman. Unlike his contemporaries, Basquiat never received a large solo exhibition at a New York museum during his lifetime, says Jordana Moore Saggese, an associate professor at the California College of the Arts, and the author of the only art history monograph of Basquiat. "Historically there has also been a lack of representations for non-white artists in mainstream institutions," says Saggese, who notes that few undergraduates are even taught much about him. They were "deeply divided over the question of whether an artist could be both commercially successful and critically significant," she told AFP. During his lifetime and even more so now, few museums can afford to acquire Basquiat's work. Instead their best hope is to wait for wealthy collectors to perhaps bequeath his work in the coming decades. Beyond blockbuster exhibitions in cities such as Basel, Paris, Rio de Janeiro and Toronto, Saggese estimates that 85 to 90 percent of Basquiat's work is in the hands of private collectors. Yet Basquiat's appeal lies far beyond the hallowed institutions of fine art. "With the rapid circulation of images and ideas via social media networks, artists like Basquiat are no longer as dependent on the traditional image machine of art criticism or art history for visibility," ventured Saggese. There are movies and documentaries about him including "Downtown 81," in which the young charismatic artist played himself aged 20. "One could argue that in the years since his death, Basquiat's presence is more emphatic in popular culture and mass media than in art museums," said Saggese. There's even a children's book, written by Javaka Steptoe and called "The Radiant Child," to introduce him to the next generation. "Children love him because his artwork and their artwork is similar," says Steptoe. "He gives them permission to be what they are." "He's given so many young people, especially young people of color, in this city the license to believe that they could be important artists," he said. "He's a hero to young people the way Warhol was to my generation."